Abstract: During early drug discovery, the study of metabolism plays an essential role in determining which drug candidates move forward into development and later stages. Current methods for analysis to identify metabolic soft spots are through LC/MSn interpretation. The main challenge in this work has always been the structure elucidation of metabolites, and there have been a number of strategies developed to address these difficulties. Typically, the use of data dependent scanning has been the primary mode of data acquisition for structure elucidation, but in the past several years the use of MSe or All Ions Fragment (AIF) acquisition has become more prominent. 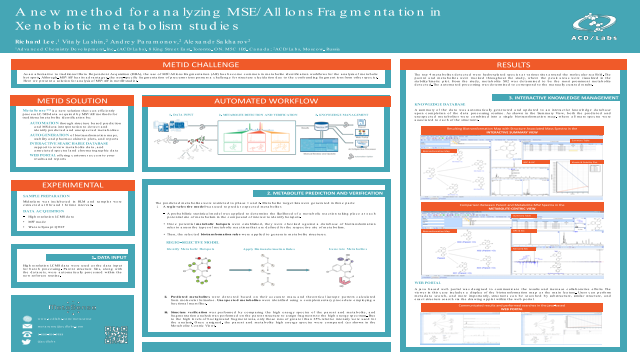 Here we present a computational routine that automatically analyzes MSe/AIF data for LC/MSn based drug metabolism studies.Summary: As an alternative to traditional Data Dependent Acquisition (DDA), the use of MSE/All Ions Fragmentation (AIF) has become common in metabolite identification workflows for the analysis of metabolic hot spots. Although, MSE/AlF has its advantages, the non-specific fragmentation of precursor ions possess a challenge for structure elucidation due to the confounding fragment ions from other species. Here we present a solution for analysis of MSE/AlF in metID studies.